Updates on the Leafs, Hurricanes, Bruins, Ducks, and Senators in your NHL rumor mill. TSN: While the Toronto Maple Leafs insist they’re not shopping restricted free agent William Nylander, Pierre LeBrun reports teams are keeping track of the contract impasse. He speculates the Leafs might change their minds if this standoff drags into November and the Dec. 1 deadline to sign Nylander approaches. LeBrun suggests the Carolina Hurricanes could be a team worth watching because of their prior interest in Nylander and their defensive depth. LeBrun believes Hurricanes blueliner Brett Pesce would be of interest to the Leafs, as he’s a top-four defenseman on a six-year contract with a cap-friendly contract worth over $4 million annually. SPECTOR’S NOTE: The Hurricanes could be reluctant to part with Pesce, preferring instead to offer up Justin Faulk, who’s been linked to the Leafs for some time in the rumor mill. LeBrun recently reported Leafs general manager Kyle Dubas contacted the Hurricanes this summer about Faulk but it was a brief conversation and Nylander wasn’t brought up. Darren Dreger addressed Toronto Maple Leafs winger Kasperi Kapanen’s strong start to this season skating alongside Auston Matthews and the possible effect upon his next contract. 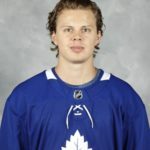 Kapanen is in the final year of his entry-level deal and Dreger speculates he could be looking at $5-million per season if he reaches 40, 50 or 60 points this season. It could mean the Leafs face shedding someone in a cost-cutting move. SPECTOR’S NOTE: That move doesn’t have to happen this season but it certainly must take place next summer. Cap Friendly indicates the Leafs currently have over $49 million invested in 11 players for 2019-20, with forwards Kapanen, Matthews, William Nylander, and Mitch Marner to re-sign, as well as defensemen Ron Hainsey and Jake Gardiner to re-sign or replace. By my conservative estimates, Matthews could get around $12 million per season, Marner at least $8 million, and Nylander between $4 million to $8 million depending on the length of the deal and how much the Leafs are willing to pay. If Kapanen becomes a $5 million per season player, the Leafs simply won’t have enough cap-payroll space to fill out the remainder of their roster. Matthews and Marner won’t be going anywhere, meaning the choice could come down to Nylander or Kapanen. SPECTOR’S NOTE: Heinen showed promise in his debut last season with 47 points but he’s scoreless through four games this season and was a healthy scratch against the Red Wings last Saturday. Bjork has two points in four games and seems to be regaining his form after being sidelined by shoulder surgery last February. The Bruins aren’t under any pressure to make a move right now and will likely remain patient but could keep an eye on the trade market in the coming weeks. Bob McKenzie reports Ottawa Senators GM Pierre Dorion and agent Pat Brisson met yesterday. “The obvious point of discussion there was preliminary talks about Matt Duchene’s future.” He’s an unrestricted free agent next summer and can sign an extension at any time. McKenzie reports the chilly contract standoff between the Anaheim Ducks and restricted free agent Nick Ritchie shows signs of thawing. It’s expected the young forward could get a three-year deal in the coming days, provided there are no further hiccups in negotiations. I have Cory Crawford on my fantasy team, stumbled on this while trying to confirm that he is returning this week. It seems likely that Anton Forsberg will be placed on waivers today, ahead of Crawford returning tomorrow for CHI…unless of course CHI can get something for him in trade. He was fairly solid as a starter for half of last season when Crawford went down with a concussion. Do you think Forsberg would clear waivers? Which teams might nab him? At the moment, the one team that MIGHT file a waiver claim would be Toronto, having lost the experience of both McElhiney and Pickard (to waivers) … but they sit well down the pecking order so it’s doubtful he clears all teams in front of them. On Nov 1 and thereafter, the team with the lowest points in the standings has first crack. At this stage, however, the order of selection remains based upon last season’s final standings. TOR was my first thought as well. If my understanding is correct though, they would either have to keep 3 goalies at the NHL level if they take him, or waive Sparks which wouldn’t put them ahead of where they are now. If Leafs do act and are successful in acquiring him— it would be 3 goalies up as I can’t see Leafs gambling again with waiving a goalie– Sparks would get grabbed IMO. That said— I think Leafs will not grab him off waivers (if it gets to their position in the pecking order). Pengy, I’m not sure about the rules here. If a player is grabbed off waivers, can he not be demoted? So in this example, can the Leafs not just send him down after claiming? The claiming team would have to keep him up for 10 games/30 days and then put him back on waivers to get him to the minors. But the point everyone is missing is, if the waiver process DID get to the Leafs that would mean 25 teams had already passed, The 5 that would choose to claim or not after the Leafs would be Vegas, Boston, TB, Winnipeg and Nashville. Does anyone see any of them claiming him if TO then tried to send him to the AHL through another waiver process? And unless one of the other 25 lost a goalie in the interim, why would any claim him this time around? They probably wouldn’t, BUT Toronto would have to carry 3 goalies for 30 days before they could even put him on waivers. Philly is doing exactly that with Pickard. See below from Ron Jull. And there’s no reason TOR couldn’t carry 3 goalies, though most teams prefer not to. I assume they would have to waive/demote someone else to make room though. It does say in the article that he would have to clear waivers, but I thought it worked differently when it involved an injury to a goalie. He has not played a game yet this year. I could be wrong though. Was he designated as an emergency call up to start the season? He was never sent down in the first place, Crawford started the season on IR. Should have said or a first round pick not and a first round pick- from yesterday. The last thing Sweeney needs to do is move his kids for another veteran. He released Stempy yesterday from his PTO. The B’s are currently in the top 5 in the league for center depth. Its only 5 games in and Dreger is darn near always wrong. Yep— a stretch. I don’t think it would happen. Dreger does muse a bit; but I do listen to what he has to say as they all do this. This he will be wrong on. I find Dreger, Lebrun, McKenzie to be right more than they are wrong. There is one player at center worth keeping an eye on and that is Nic Petan in Winnipeg. Petan has a ton of skill was a point per game guy in the Ahl last season; however Maurice doesn’t like the small guys. Petan is listed at 5’9″ and 172lbs and definely use a change of scenery because he isn’t getting an opportunity in Winnipeg, if sent down he’ll have to clear waivers and he won’t. Winnipeg depth at C is Scheifele, Little, Lowry, Roslovic adding to what Maurice said last year if Petan isn’t in the top 6 he doesn’t fit the bottom 6 for the style of game the jets want to play. I wouldn’t think the cost be high to acquire a guy you won’t give an opportunity. I wouldn’t mind seeing the Bruins being the one giving Petan the opportunity, flanked by Donato and Bjork would be a fast and skilled 3rd line. I’d go for Petan in a heartbeat. Sorry posting the day after here. Big project on the go so can’t post through the day anymore. Great post w.r.t. Petan. I’ve loved him since watching him in Jr’s. He’d be a great addition to any team. I have a gut feeling that Duchene and Dorion will come to an agreement on a contract extension as long as the team continues to show a willingness to compete every game. I think the fans will start to drift back for much the same reason. In other words, while no one realistically believes they’ll be in the hunt for a playoff spot next spring, as long the kids continue to develop and they put in their best effort game-in and game-out, all the drama and negativity surrounding the franchise last season and over the summer will fade away. We’ll see, of course, if that optimism is misplaced soon enough – but so far anyway I like what I see from the likes of Chabot, Duchene, Stone, Ryan, Borowiecki, Wideman, Harpur, White, Tierny, Boedker, Tkachuk, DeMelo … and especially Lajoie. Whodathunk! Actually, I’m a firm believer in systematic hockey. The players are all so good right now, if they just play the proper system and compete at or near 100% they’ll win more than they lose. Prim examples this year are Ott and Mon. Steady goaltending is a factor as well. If Ott and Mon miss the spring dance, it won’t be by much. Both Guy and Claude are among the best coaches in the league. I’m with you on this. Ottw and Mon have impressed me and have played above what I thought they would show. Speed and systems working very well for them. I still think it will be a stretch for them to get to the playoffs this year. To me the Atl top 3 are locked (in no particular order— TBay, Bos, Tor)— so they’d be vying for Wildcard spot with 3 or 4 teams from Metro plus FLA.
Next year and beyond will be an upward swing for both teams. Great post. Doesn’t matter which team you cheer for, you have to respect the starts to the season for Ottawa and Montreal. Credit to the players and the coaches. Both teams have been enjoyable to watch and there’s no reason, barring injuries, they can’t keep playing well. so far so good George, the play of Tierney and Demelo is taking a bit of the sting out of the return for EK. Let’s not forget Anderson has stood tall in nets while his GAA is not great at 3 his SV% is respectable at .925 they need above average goaltending to compete. Lajoie is a very pleasant surprise. To have a reasonably successful season given all the kids throughout the line-up they absolutely HAVE to hope Anderson has one of his patented good-year-after-a-bad-year seasons. But the underlying factor is, he’s 37 and there’s still 76 games to go! They can’t afford and injury of any sort to Anderson because I really doubt Condon has it in him to repeat what he did the season before last. I think we need to include Lajoie and Formenton in that discussion. I like what I’ve seen from them. I’m not impressed with Faulk so far and do not see him as the answer for Leafs. Pesce— that is an opportunity. Focus as I’ve said should be for a D improvement. I do not see a trade happening for Nylander that nets Leafs a D upgrade and a 3rd line winger— that would be over-paying by the receiving team. If WW does in fact get traded; it will come down to the panic or “dire” need by another team (highly likely to be outside of the ATL Div)for a young scoring winger and then… do they have space and more importantly …. do they have the D upgrade the Leafs need. Leafs do not need another centre and winger for winger does not help a team loaded in forwards. We’ll see what happens in a couple of weeks. Pengy , agreed with Lajoie and Formenton I would add Batherson to the list for later this year / next year. Pengy I listed some teams yesterday that are in fact in need of scoring, whether Nylander is the answer or not is up for discussion. Sorry forgot Batherson— right you are. Of those I think Edmonton needs a WW most. Him playing with McD would be awesome. The ask of course would be Nurse and GMPC has made enough bonehead moves that he couldn’t afford to make a move of Nurse going out. Another team I fell that would fit well for WW is Van— having him with Petersson for 10 years would be Van’s investment in the 2018 version of the young Sedin twins IMO. Acquiring Faulk would then make it necessary for the Leafs to find TWO responsible stay-at-home D to play alongside them as both absolutely need that sort of “protection” given their styles of play – much like Karlsson functioned best with Methot as his D partner. Completely agree George. I have been saying for a while here that I don’t understand how the people who want Gardiner out want Faulk coming in. Faulk is a RH version of Gardiner. You’re correct, they do not need another D like that. How is Kapanen worth $5M/season as a 40 point player when the Leafs signed Brown and Hyman for $2.1M/season after they nearly had 40 points. I believe Brown had 20G as a rookie. Minnesota has a couple pieces that Toronto could use on D and a good defensive winger. They have Dumba, Spurgeon, and Niederreiter. Daryl, no chance Minny does that. Dumba is a better player than Gardiner and Nino is a better player than Nylander. Why would Minnesota even consider this? Thank God for the Nylander update. I see Brian Smelliott got yanked vs the Panthers last night. How much more of the season are the Flyers going to waste before Carter Hart gets the call? As a Philly fan Im beyond tired of the substandard goalie albatross derailing season after season. Harts a 2 time WHL goalie of the year, World Jr Gold medalist. PLAY him, play him now!!! Theres no possible way he can be any worse than the Elliott/Neuvirth combination. are they still carrying Pickard with the big team as a 3rd goalie. Kind of ties in with the waiver discussion above – if they try and send him to their AHL team does he have to clear waivers again? They have to keep Pickard for 10 games or 30 days. He got the shootout win in relief of Elliott last night. A trade that will never happen but Toronto in Nylander have exactly what the Bruins need and no at 8 million. Bruins need another winger who is creative and with speed and Toronto needs a young solid D man and the Bruins have many. These two teams won’t pull the trigger but in my humble opinion they are the best match for each other. Heiden Bjork Donato have all been an healthy scratch this year they are good young prospects but they are not Nylander. Their top line is best in NHL but Krech is still short one winger that’s why they traded for Nash last year. I’m just saying Boston has Carlo Grezlyk Zboril Lauzon Anderson Vakanen sorry about spelling I’m not looking them all up lol. Bruins would never move Charlie. I believe a trade never happens with these two teams but I see the need for both. George O is bang on about Justin Faulk. His offensive numbers are close to Gardiner and his defensive play is not that much better than Gardiner if you watch him play for 7-10 games in a row not the 1-2 times a year you might see him against Toronto. The stupidity of trading an elite offensive player for a mediocre right defenseman cannot be justified since there are other assets you can offer. Leafs need to get rid of Hainsey and Zaitsev who appear lost (Hainsey) and visibly scared(Zaitsev). Hainsey is 38 going on 52 and Nikita has never been the same since he had the flu last winter. They can get two experienced blueliners a la mode Jamie Macon and Ric Nattress for those of you who remember that far, or dump 7.5 million in their salaries and bring up Borgman and Rosen and move Dermott and Ozhiganov to 3 and 4 spots and let them develop. If we could do Willy plus Zaitsev for Faulk without holding any salary, I’d be down for that. another IMO…..Faulk is not the guy at the price of Nylander or Kapenen…. 2. Replace Gardiner for next year, until the year after where some contracts come off the books. resigning faulk at that point would be easier. Lets have a look at the alternate. Where do the Leafs go from there? Do they keep Marner and not match the offer sheet? Do they match the offer sheet and lose Marner, Gardiner (or his replacement)? I’m all good with trading Nylander right now if it makes signing the big 2 easier next year. Brady Tkachuk out a month with a knee injury. Unfortunate,he has been a spark in the Sens lineup. S*^t! If it wasn’t for bad luck they’d have no luck at all. “Logan Brown, who is expected to miss four-to-six weeks with a lower body injury after tripping on a stick during practice. Joining Brown on the disabled list are — take a deep breath — Jim O’Brien (broken leg, six months); Filip Chlapik (twisted ankle, day to day); Marcus Hogberg (unspecified, but returning “no time soon,” according to Mann); Ben Sexton (unspecified, two to three weeks); and Andrew Sturtz (lower body, three to four weeks). Aaron Luchuk, who had been with Brampton in the ECHL, is also out with a concussion. Well, if Nick Paul is the call-up, it’s time for him to crap or get off the pot. I mean, the guy HAS to start playing using his size to advantage. If he remains a Kaspar Milquetoast with this opportunity it’s time to cut him loose. Another option might be Batherson who’s off to a decent start in Belleville. According to Ian Mendes at least it isn’t a knee – it’s a torn ligament elsewhere in his leg and will not require surgery. But it’s still a frikken month! dubas is meeting with nylander today. Assuming cap goes up $5M then cap is $35M. Subtract Hainsey = $2M over cap for 1 year until Marleau expires. Other than signing players above for less, a way to circumvent this is to bridge kapanen. Other option is to trade zaitsev/gardiner/kapanen/johnsson or let gardiner walk. Either way, its going to be tight until 2020, every dollar counts & the defense needs to be addressed asap. If gardiner & hainsey walk, then a bad defense gets way worse.